I was asked if I planned to watch his interview tonight. I said, "No. I don't care. Plus, I don't like Oprah." I have to wonder though, after all the crying, gnashing of teeth, etc. will he receive the same "Hero Treatment" the numerous baseball players have received? Vintage Media circus. They deserve each other. Another reason I don't watch much TV. If he'd have been riding the white pony and toking choom "total absorption" style, he could have just called it "training" to run for president (hint for a scorched earth defense angle if the Feds go after him). Like the way you rendered Lance. Reminds me of Norman Osborn getting the sweats in "The Green Goblin's Last Stand" (70s Spider-Man comic). I like the disOWN title almost as much as the art. Frankly my dear, I don't give a damn. Neither has a speck of credibility. I was going for a sinister vibe. Ed B, I love it. Re: Lance Armstrong - After he dumped his wife (who was with him all through his fight with cancer) for Sheryl "Two Squares of TP" Crow, I suspected that the guy was a bit of a weasel and a lout. "That's a shame." (said in an apathetic "Seinfeld" tone of voice). I agree. There was a skunk and a weasel hiding in his shed. 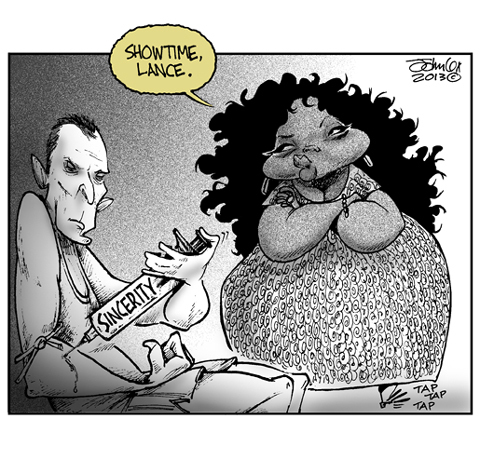 Everyone else beet me to the Armstrong thing so I just have to say that I love the O. caricature! This page contains a single entry from the blog posted on January 17, 2013 5:11 PM.